On 24 July 2015 I visited my pappou’s village Agia Irini (Akdeniz) for the last time this year. After arriving back from a short break on Crete late the night before, my husband, our good friend Alex and I got up early and hit the road. We crossed at the Kermia border crossing and made our way to the village that I feel such a strong connection with. We went to greet our dear friend Erol in his kafenion (cafe). I had promised to take Erol out for lunch to thank him for all of the help he had provided me over the past two years by finding people from Agia Irini for me to interview, along with his incredible hospitality. We drove down the dirt track, through fields of tomatoes and citrus trees to Caretta beach, known for its rare turtles: the Green Turtle (Chelonia mydas) and the Loggerhead Turtle (Caretta caretta). We arrived at a wonderful restaurant there which is famous for its fresh seafood and patronised by both Greek and Turkish Cypriots who travel there from all over Cyprus. There is no menu. The owner, the village Muktar (mayor) serves traditional Cypriot meze, a range of different foods. We devoured calamari, homemade dips and breads, as well as salads and an incredible fish which was caught that morning. 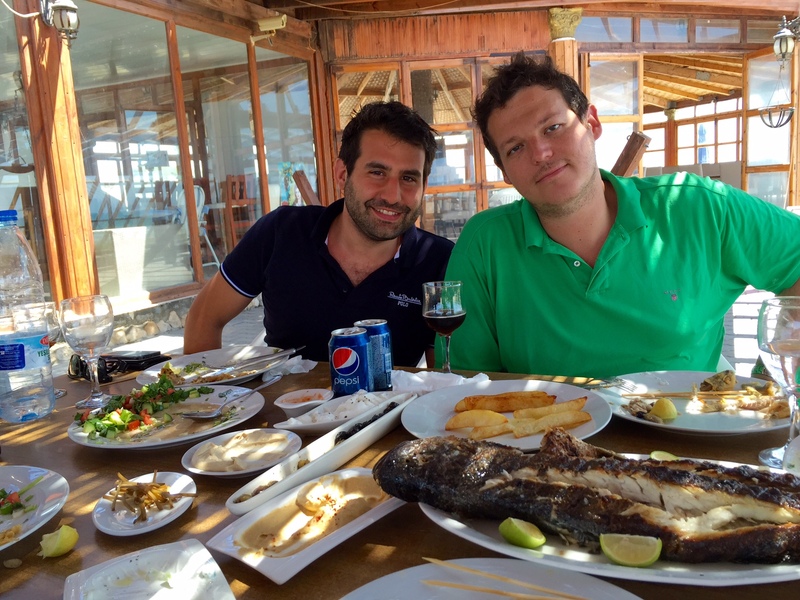 As we sat there, eating and enjoying the sounds of the ocean, I interviewed Erol. Erol was born in the mixed village of Choulou in the Pafos district, in 1951. He recalls walking to school with both Greek and Turkish Cypriots as a child. He attended Greek Cypriot weddings and had a peaceful childhood spent playing with both his Turkish and Greek Cypriot friends. Erol explained to me that before 1963/64 he couldn’t tell a Greek Cypriot from a Turkish Cypriot; “As children we looked at each other the same, as Cypriots”. Erol’s father, Ahmet Hüseyin, fought in the Cyprus regiment of the British army in Egypt during World War Two. He left for war and returned from war with a close Greek Cypriot friend, Constantis. In 1963/64, when civil unrest broke out in many villages of Cyprus, he and his family left Choulou and migrated to Stavrokonnou, located in the southern foothills of the Troodos mountains, which was a solely Turkish Cypriot village at the time. It was less than 20 miles away, still in the Pafos district, but nevertheless a big upheaval. Erol finished high school in 1969 and moved to Lefkosia to train as a police officer. He remembers one day being called to interview a Turkish Cypriot man about a crime; “He did not speak a word of Turkish, not one!” Erol exclaimed. He explained to me that before the war, it was common for some Turkish Cypriots to speak only Greek. This was highly problematic after the 1974 war, when these people had to move to the north of Cyprus, where the Greek language was eroded and the Turkish language dominated the social and political environment. All of Erol’s family were displaced by the 1974 war. They had to move north and settled in Lisi (now Akdogan). As a police officer, Erol moved around. When he was stationed in Agia Irini he met the beautiful Şenel. They married in 1976 and have two daughters and a son. Their son was to be married a few weeks after we left Cyprus, and Erol and his family had been very busy building and preparing a new house for the young couple. In his culture, the man’s family prepare the new home. How hard must it have been for the refugees after 1974 when they had lost all their assets in the south? When young men wanted to marry in 1975 or 1976 (as Erol did, marrying into the family of Pappou’s best friend Mehmet), their families could not provide for them. I believe that Şenel’s family were generous and kind, and helped Erol and Şenel. Erol is a deep thinker, a kind and generous man to whom helping others is second nature. Erol remembers hearing of a Greek Cypriot and Turkish Cypriot couple marrying in Agia Irini and of five Turkish Cypriots marrying Maronite Cypriots from the close-by Maronite village of Kormakitis (Arabic: Kurmajit, Turkish: Koruçam). 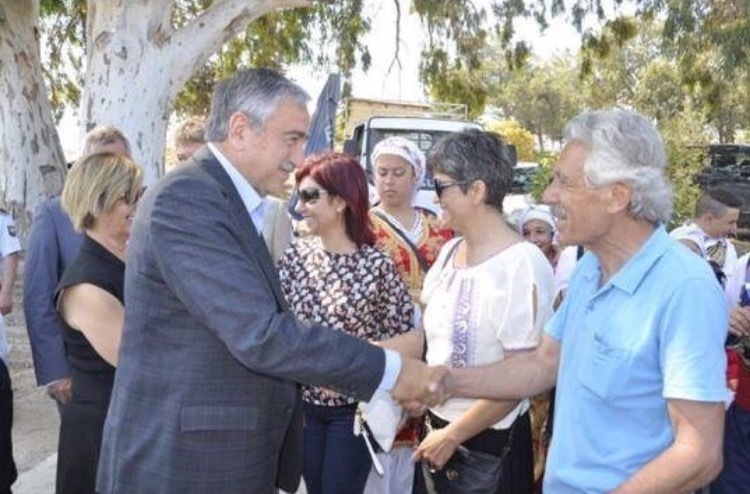 Erol is an old friend of Mustafa Akıncı, President of Northern Cyprus. I hope that as weeks and months go by and more and more progress is made in the reunification talks, Erol’s hopes for the island to enjoy peace and security and to be rid of troubles and war start to look more and more realistic. There will have to be a turning point where the people’s cynicism is punctured and they start to believe that their dreams might become reality! Erol speaks Turkish, Greek and English. After 29 years of segregation, when the border opened in 2003, Erol’s Greek language came back to him. He speaks Greek beautifully! His English is used a lot both with tourists and with the young British university students who come every year to study the caretta turtles. Erol is their first contact in the village, every year, and his cafe their cool haven. Why does Erol run the kafenion? He bought it when he retired, so he’d have something to do. The old men meet there, or sit outside under the trees. He organises women’s evenings, he is deeply committed to and involved with his community. In his ‘retirement’, too, he indulged and developed his lifelong interest in art. He draws, paints, makes turtles from rocks, and has lately started sculpting. His first ever sculpture ended up on the front cover of a magazine. He was interviewed by RIK TV (from the Greek Cypriot south) about the problem of missing persons from both the north and the south, as a result of the 1974 war. Erol is a leader, in the truest sense. He is wise, thoughtful, sensible, kind, and people are drawn to him. 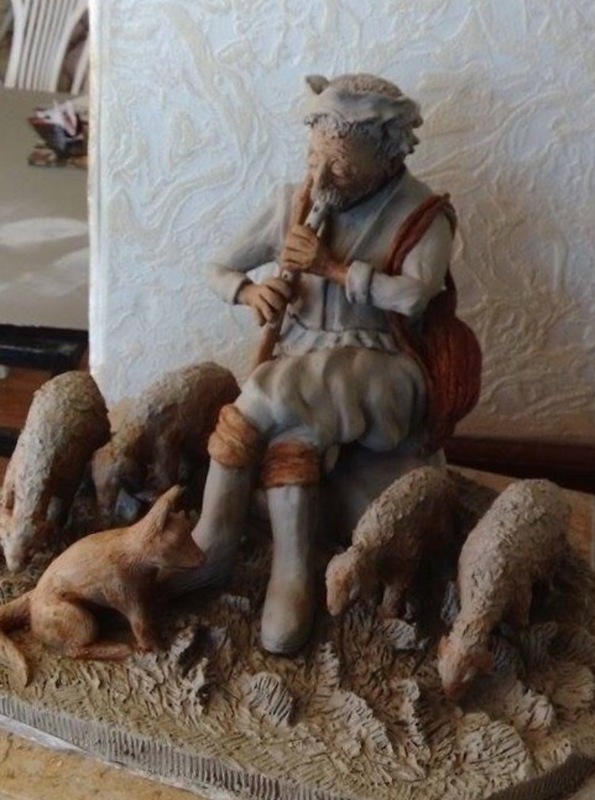 I am so lucky that my mum found him back in 2013, when we were looking for Pappou’s old friend, Mehmet Emin! As we left Agia Irini we visited the church where my great, great grandfather was once the priest. I left an icon of the saint in the church on behalf of my family. The Muktar held the key to the church and promised to ensure that the icon remained safe. I am so touched by the warmth, love and respect shown to myself and my family by the beautiful Turkish Cypriots of Agia Irini. When I first went to Cyprus in 2010 I was surprised at how I connected with the country. By now, I have found my roots. They are in Agia Irini.